Canada has more than 500,000 international students currently enrolled in study programs across the country. Not only can people who choose to study in Canada benefit from a world-class education — students and graduates are also set on a path that may lead to incredible career opportunities and permanent settlement in Canada. Let’s find out how it all works. Many international students are choosing to study in Canada Canada over other potential destinations — such as the United States, the United Kingdom, Australia and France — because Canada offers certain advantages that may not be available elsewhere. International students in Canada can work for up to 20 hours per week during semester, and on a full-time basis during school breaks. The tuition fees to study in Canada, even for international students, are usually lower than in other countries. The spouse or common-law partner of an international student may accompany the student in Canada. Not only that, spouses and partners may obtain an open work permit, allowing them to work any hours they wish and for any employer. International students in Canada can bring their children to Canada, and the kids can attend one of Canada’s public elementary or secondary schools without needing their own study permit. Canada’s largest cities are ranked among the best student cities by the QS World University Rankings, with Montreal ranked the best student city in the world and Vancouver and Toronto not far behind. Graduates can work in Canada for up to three years on an open post-graduation work permit (see below under ‘Earn’). Rather than closing the door on graduates who complete their studies in Canada or making things incredibly difficult, as some countries may do, Canada actively sets out to provide permanent residence pathways to students and graduates (see below under ‘Stay’). Canada’s liberal citizenship naturalization process allows international students to count time spent on a study permit towards citizenship residency days requirements. McGill Avenue in downtown Montreal, with McGill University in the background. Montreal was recently ranked the best student city in the world. Sounds good, doesn’t it? But remember, this is a two-way street. Prospective students need to follow a few steps before they too many benefit. There are hundreds of institutions to choose from. You may already have some idea as to which areas of study are of interest to you, or a preference with regard to the type of institution and location. Universities Canada offers a strong database for beginning your search. Colleges and Institutes Canada also has a tool designed for finding study programs. Maclean’s magazine offers some great advice on choosing the right college or university for you. We also have this handy article on finding the right study program in Canada for you. International students planning to study in Canada for a period longer than six months need a study permit. Study permit applicant need an acceptance letter from a designated learning institution (DLI). A DLI is an institution approved by a provincial or territorial government to host international students. The DLI list is subject to change on an ongoing basis. The next step is to get admitted to the chosen college or university. Prospective students should take note of application deadlines, potential language requirements or other entrance requirements, and to what extent, if any, the chosen study program includes distance learning. This may prove important in the study permit application, or at a later stage if applying for a post-graduation work permit. Having a letter of acceptance from a DLI is crucial. Without this document, a study permit may not be granted. This document is issued by Immigration, Refugees and Citizenship Canada (IRCC) allowing you to study in Canada in your chosen study program. Canada’s economy is diverse and growing. As a graduate who chose to study Canada, you could be a part of it. As mentioned above, international students can actually enter the Canadian workforce before graduating. This allows them to gain an income, build up valuable Canadian work experience, and create professional connections than can lead to opportunities at a later stage. The big earning opportunity, however — in monetary and networking terms — comes with the post-graduation work permit. A post-graduation work permit is an open work permit that allows graduates to work for employers anywhere in Canada for up to three years. It represents a unique opportunity to build a long-term life in Canada. But how does this integration work in practice? Under many of Canada’s economic immigration systems and programs, international students and graduates have a clear advantage. This is a fast-track immigration program for individuals with recent work experience in Canada in a skilled occupation. Graduates are prime candidates, given that they can obtain an open work permit for up to three years — plenty of time to build up the required experience for the CEC. Candidates need 67 points in order to be eligible. There are points available for previous study in Canada and for work experience in Canada. The FSWC points grid also favours younger people with language skills, giving most students and graduates an advantage. This program for qualified tradespersons requires candidates to have a full-time offer of employment in a skilled trade from up to two Canadian employers or a certificate of qualification from a Canadian provincial or territorial authority. Towards this end, trades students and graduates have a great opportunity to build connections in Canada. In November, 2016 IRCC made significant changes to how candidates are ranked in the pool under the Comprehensive Ranking System (CRS). Under the tweaked system, students who graduate in Canada receive up to 30 bonus CRS points in addition to the points received for the level of education in its own right. This initiative has led to a significant upswing in the share of graduates obtaining an invitation to apply (ITA) for permanent residence. There are also pathways to permanent residence through the provinces. Let’s begin with Quebec, which operates a distinct immigration system. The Quebec Experience Program, or PEQ (Programme de l’expérience québécoise), offers international students the opportunity to begin their immigration process before completion of their studies, a privilege generally not granted in other provinces or at the federal level. Under the QSWP, graduates of study programs in Quebec can receive a significant number of points through the area of training and previous stays in Quebec factors. Unlike the PEQ, graduates with limited or no French ability may be eligible to apply. Canada’s provinces are able to nominate people for permanent residence through their Provincial Nominee Program (PNP). The eligibility requirements set by the provinces for these programs is generally favourable to people who choose to study in Canada, as these highly-educated immigrants-to-be also have strong language skills and experience living in a local community. The provinces that prove most popular with students — Ontario, British Columbia — have dedicated PNP streams for students and graduates who wish to transition to permanent residence, as do many of the other provinces. Sometimes, these PNP streams may provide a pathway to permanent residence for students or graduates who may not be eligible under Express Entry or, if they are eligible to enter the pool, struggle to reach the CRS cut-off threshold in Express Entry draws. Under the BC PNP, graduates of institutions across Canada may apply, even if they didn’t study in BC. Masters and PhD graduates in Ontario may apply to the OINP without a job offer. Canada PNP Live Tracker — All the latest updates, as they happen! 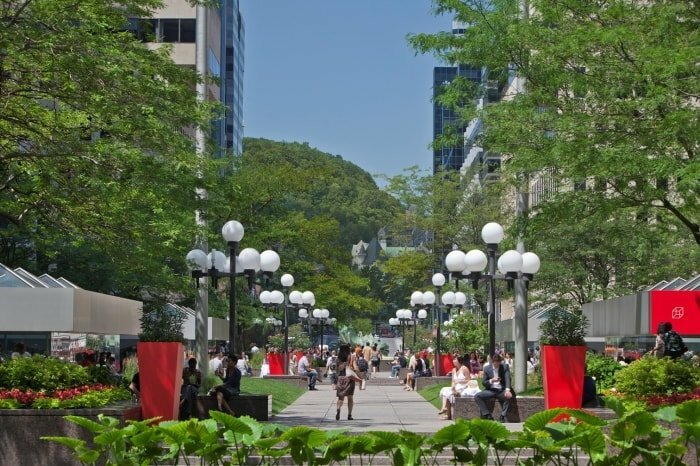 Image of McGill Avenue, Montreal courtesy of Tourisme Montreal / Stephan Poulin.